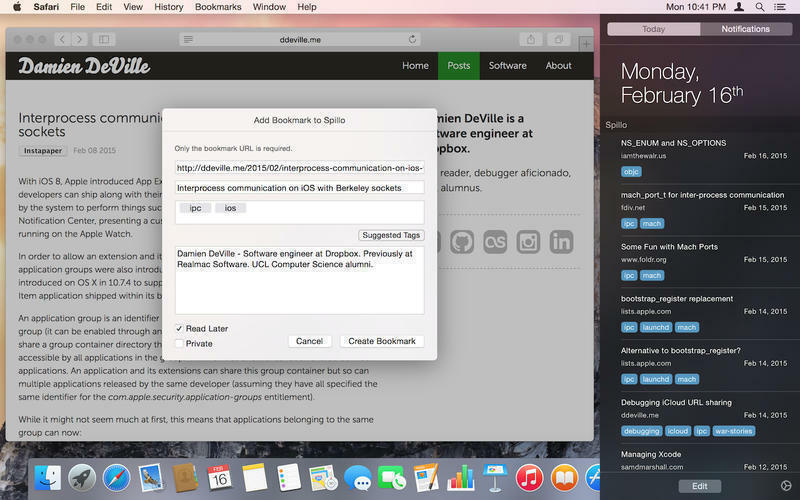 Take full control over your bookmarks on Pinboard. Is there a better alternative to Spillo? Is Spillo really the best app in News category? Will Spillo work good on macOS 10.13.4? Spillo is a powerful, beautiful, and amazingly fast Pinboard client. 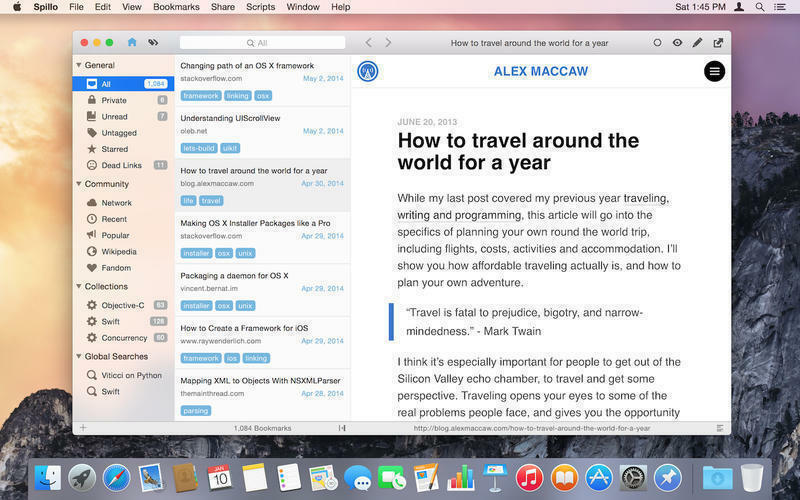 It lets you browse and organize your bookmarks in a stunning modern interface. 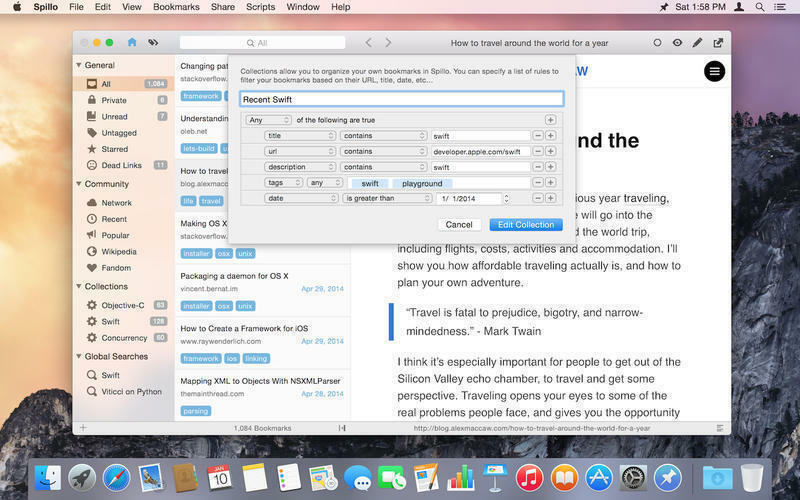 It also makes creating a bookmark from anywhere on your Mac as convenient as possible. 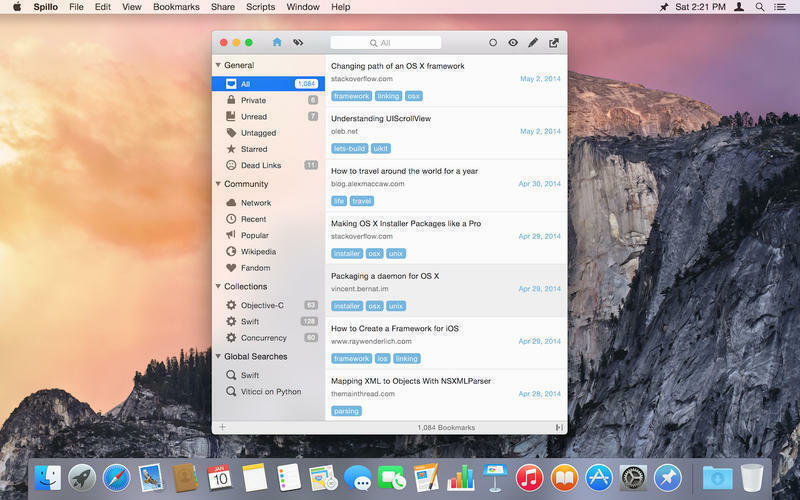 A beautiful interface: Spillo has a beautiful modern interface that feels just right at home on your Mac. It uses all the latest technologies that you would expect from a modern OS X application. Easily organize your bookmarks: Spillo allows you to create powerful collections by specifying a number of rules. Don't limit yourself to Pinboard's default organization and create collections that just match your needs. Create powerful searches: Spillo also allows you to create and save public searches based on a username and a number of tags. You can keep recurrent searches right in your sidebar. Share to a multitude of services: Spillo supports sharing your bookmaks to a multitude of services such as Instapaper, Pocket, Twitter and Facebook. Should you be annoyed by some services, you can easily disable them in the Preferences. 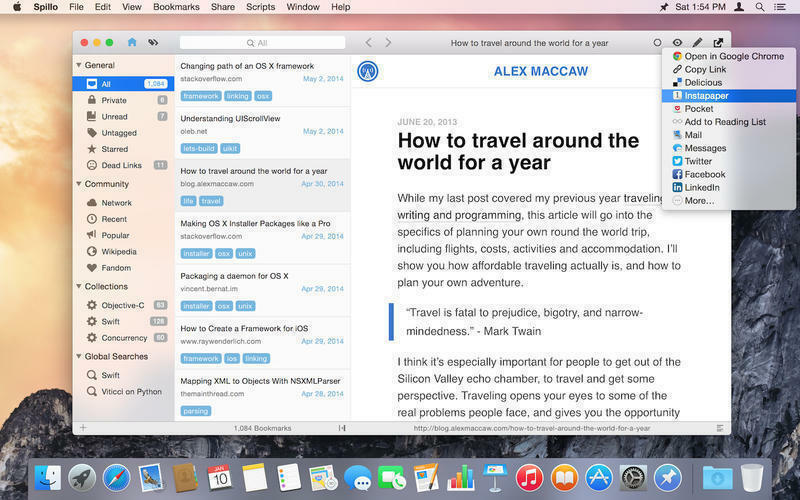 Quickly create a bookmark from anywhere on your Mac: Spillo's bookmark creation window can be brought up from anywhere on your Mac. Use the (optional) menu item or global shortcut to bring up. The URL field will also be pre-populated based on the content of your clipboard. Browser integration to make bookmarking simpler: Spillo comes with browser extensions that make bookmarking from any page trivial. The bookmark creation window will be pre-populated based on the content of the current page. They are available for Safari and Chrome. Spillo is super fast! : Spillo's edge is its speed and responsiveness. Don't wait on a slow network to process your data, it caches it and syncs whenever it's more convenient. All the shortcuts you would expect: Spillo has a multitude of shortcuts that make browsing, organizing and editing your bookmarks so much quicker. AppleScript support: Spillo has full AppleScript support for browsing, creating and updating bookmarks so it's easily extendable. Want to create an Alfred workflow to create a new bookmark in Spillo? You can do it with a couple of lines of AppleScript. Check this script that retrieves the current tab in Safari and presents the Spillo window to create a bookmark for that URL. Create your own Sharing Service plugins: Spillo has an open plugin architecture that lets you extend the built-in sharing capabilities by building your own Sharing Services. Building a plugin is really easy, just check out the small SDK on GitHub and start building!